A lesson for our daily life trying to live our Catholic faith; how do we live each day in a way that pleases God? That wins His approval? The Publican in the Gospel gives us the answer. We please God and go "down to our house justified" by humbly acknowledging our sinfulness and begging God for mercy. A publican was a tax collector, working for the Roman government. They were hated by their fellow Jews because they collected Jewish money to support a foreign and pagan colonial government. They were considered, generally, to be cheats and thieves. One bidded for the job of tax collector and (unofficially) recouped one's loss bidding for the job by over-taxing the people. INTROIT : The words of the Introit are the words of the humble Publican. "Despise not my petition." God has every reason to be deaf to our prayers; we have no claim on His mercy. So we ask with total humility, appealing to God's kindness, not His strict justice. Though we are but worthless sinners, and deserving of all manner of suffering, God defends the humble sinner from the proud sinner who persecutes the humble who turns to God for refuge. COLLECT : Contains a beautiful piece of theology. God manifests His power chiefly through mercy! Mercy is a power. Why? 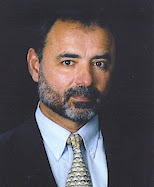 Our human nature contains a built-in principle of self-preservation. We naturally put up our arm to protect us when we see something come at us in attack. When someone tries to do serious harm to us, our natural tendency is to perceive the aggressor as an enemy we need to repel. It takes a lot of will power in us to go against our natural tendency and forgive someone who seriously hurt or attempted to hurt us. God, however, has the power to go beyond strict justice (without harming it, without becoming unjust Himself) and show us mercy for the sins we commit. This is why we need His grace in order for us to show the same kind of mercy. It takes a real gift of grace for human nature to show godlike mercy on people who have seriously offended us. Like the repentant Publican, we beg God for more of His mercy. If God is so willing to forgive us, how can we deny mercy towards others? EPISTLE : The different gifts we have (some better at this, others better at that) can become a real source of pride and hence division among people. Saint Paul says in one of his epistles that big egos are the reason people cannot work together. He called it "the flesh," and said the flesh is the origin of human divisions. Our tendency is to justify ourselves and to point out the defects of others (like the Pharisee in the Gospel). So man often prides himself in the gifts he has, and looks down on others. But if we see gifts as coming from God and belonging to Him (they are on loan to us and not really ours, as we said last Sunday), and that God gave them to us, not for our own glory but for the good of others, then we can avoid the mistake of proud self-righteousness - the sin of the Pharisee. GRADUAL/ALLELUIA : Talks about the vision of God, just as the Gospel talks about how two different men were seen (vision) in God's eyes; one condemned, the other justified. The humble man asks God to take care of him, like the apple of one's eye. God sees all things as they are, perfectly. God sees what is hidden in man's heart. Having perfect vision, God is a perfect judge. How He sizes up a man is true and accurate. How He evaluates us is the only important thing; man's judgment means little to us in comparison. In the Alleluia, we are reminded that Zion and Jerusalem (Zion is a hill or mountain in the city of Jerusalem, and the site of the Temple where sacrifices were offered to God) is the place of sacrifice. Christ made His sacrifice in Jerusalem. His sacrifice was acceptable to God and justified us. It is fitting that a hymn to God be sung in Zion, and a vow paid in Jerusalem. A vow, or promise to God, was paid by the Jews by making sacrifice to God. GOSPEL : A Pharisee does a lot of good, but is condemned in God's eyes because he prides himself in good acts while lacking some important inner qualities such as humility; and a Publican is guilty of a lot of bad actions but is approved in God's eyes because he had some important inner qualities such as humility. OFFERTORY : Because we are sinners, we make enemies (the people we offend by our sin). Even if we are good, we have enemies (just as the good Jesus had enemies). The Publican had an enemy in the Pharisee. Satan, too, is our unseen enemy. The Offertory is the prayer of a persecuted man, seeking security in God from his enemies. SECRET : There are two sacrifices at every Mass. The first are the sacrifices we offer; the bread and wine which represent our work and struggles on earth. The second is the sacrifice of Christ on the cross. The two are joined together at the altar by God's command. We do not offer these sacrifices because we think it's a good idea. We offer these sacrifices because Christ commanded we "do this in memory" of Him. Just as there are two kinds of sacrifice (the perfect one of Christ giving value and worth to our own), there are also two kinds of effects of the Mass mentioned in the Secret : the glory of God and, secondly, the salvation of man. God is glorified when we sacrifice to Him, and when the Son lays down His life in obedience to Him. We save our souls when we sacrifice to Him, and when the Son layed down His life for the forgiveness of sins. COMMUNION : We have every confidence that what we do at Mass accomplishes its goal; that it is acceptable in God's eyes. 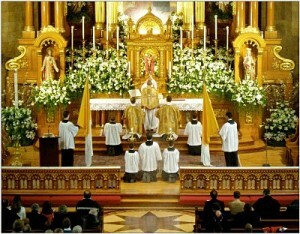 It is God who gave us the Mass, so God welcomes each and every Mass as a gift He gave us Himself. Christ is the priest, the sacrifice and the altar. The Pharisee's prayer was not acceptable to God, because it was a self-righteous praise of the man himself. The Publican's prayer was acceptable to God, for it was made in humble admission of guilt. We need to offer Mass with the same humility. Christ offered His Mass (all our Masses flow from Calvary) on the cross in total humility, not as a guilty man but as an innocent man dying for the guilty. Christ's sacrifice of "justice, oblations and holocausts" are acceptable to God the Father. POST-COMMUNION : Expresses our dependence on the Mass. Our strength weakens, when we are left to ourselves. Poor man! Just a creature, who came from nothing and will one day die and become dust, food for worms; unless God raise the body to life, that is all it will be. It is God who made us, sustains us and strengthens us. Holy Communion - the Body of the Son of God - is our food which sustains our life. Published in the Umatuna, the newspaper for the Archdiocese of Agana, Guam on August 21, 2011. 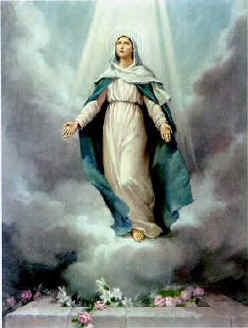 There are four main things the Catholic Church holds to be true about Mary: 1) Mary is the Mother of God (Theotokos), 2) Mary was conceived without sin and remained sinless (the Immaculate Conception), 3) Mary remained a virgin (Perpetual Virginity of Mary), and 4) Mary was taken into heaven, body and soul (the Assumption of Mary). These four teachings are Dogmas. A Dogma is a matter of Faith which Catholics must believe and cannot hold otherwise. They are also the favorite targets of those who wish to populate their churches with former Catholics. Why is this? Why do Catholic antagonists almost always first “go after Mary”? Well, because it’s easy, that’s why. Despite the many popular expressions of Marian piety, few of us know how to explain or defend what we believe about Mary. Part of the challenge in defending Mary is that Mary herself is so “quiet” in the Scriptures, and much of what the Scriptures say about Mary is figurative and implicit (e.g. “the woman” of Genesis 3:15, and “the woman clothed with the sun” in Revelations 12:1). Thus theologians and apologists, in defining and explaining the Marian dogmas, rely mostly on figurative references, “antiquity of belief”, and the argument that Scripture does not contradict what we believe (e.g. though the Assumption is not found in the Bible, the Bible does not contradict it, so we can believe it). While these explanations may suffice for Catholics, they are rejected by those who hold the “It has to be in the Bible” view of Christianity (Sola Scriptura). So what to do? At this point, the antagonist would have to agree with you on the possibility, but, would most likely stick with “it’s not in the Bible”. We might then make a case for a precedent for the Assumption of Mary by referring to three accounts in the Bible wherein bodily assumption is in evidence. In Genesis 5:24 we read: "And Enoch walked with God: and he was not; for God took him." In 2 Kings 2:11 we read : "And it came to pass, as they still went on, and talked, that, behold, there appeared a chariot of fire, and horses of fire, and parted them both asunder; and Elijah went up by a whirlwind into heaven." We don't have to assume where Elijah went, for Scripture says he “went up into heaven.” We also have a confirmation from an eye-witness in the next verse: "And Elisha saw it, and he cried, My father, my father, the chariot of Israel, and the horsemen thereof. And he saw him no more…"
So we now turn to Matthew 17:1-9, where we read the account of the Transfiguration. And who do we see there? Elijah and (wait for it)...MOSES. Now how did Moses get there! There is no record in the Bible of Moses being taken into Heaven, yet he’s at the Transfiguration with Elijah and Jesus. Not everything God does is recorded in Scripture (e.g. the assumption of Moses). So if God took three old guys into heaven, body and soul, do you think He might have done the same for His very own Mother? We have many reasons to believe that He did, not the least of which is there is no church or shrine dedicated to the burial place of Our Lady. There is also one more important matter. Jude, in his Epistle, alludes to a dispute between St. Michael and Satan over the body of Moses which some ancient writers believed to be recorded in a manuscript entitled the Assumption of Moses. Jude also directly quotes from the Book of Enoch. Neither book is in our Bible, yet both are known to Jude, and in the case of Enoch, directly quoted. This raises the question of who had the authority to dogmatically define which books got into the Bible? Answer: the same Church that dogmatically defined (in Munificentissimus Deus, 1950) how Mary got into Heaven. Ave Maria gratia plena.